You can book, change or cancel your washer repair appointment at any time online or over the phone. We’ll update you about your washer repair appointment via text, email or phone–whichever you prefer. Make sure that the washer is plugged directly into a power outlet and not into an extension cord. Be sure that clothes are evenly distributed in the washer. Mix smaller items of the same fabric type with larger items to help balance the load. Be careful not to overload the washer—remove some items and redistribute the remaining pieces. Check the display and ensure that the Child Lock or Safety Lock isn’t on. Make sure that the washer has all four feet on the ground and does not rock if you lean on it. Use a flashlight to find the source of the leak to ensure it is coming from the washer and not from a pipe or other appliance nearby. Make sure hose connections are tight and that a well fitting washer is installed. If necessary, replace washers and tighten all hoses using pliers. Washers can leak when they are not level. If the washer does not have all four feet on the ground or rocks when you lean on it, adjust the feet until it is level. The most likely cause is something lodged in the drain pump or the hose that connects to the drain pump. Check for small items, like socks, jewelry and anything else you may have left in your pockets, in the hose. If the obstruction is in the drain pump, you may notice squealing or grinding noises and sometimes a burning rubber smell. If everything looks good with the drain pump and hose, lid issues may be the culprit. If the lid assembly doesn’t create a closed circuit, it won’t work properly, resulting in your washer not draining. No matter where you bought your washer, we’re prepared to repair it. We work on numerous brands including Whirlpool, Maytag, Samsung and LG. 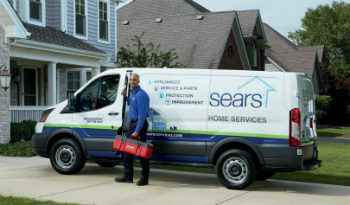 Sears Home Services is also the only nationally authorized Kenmore service provider. No one knows Kenmore better than we do. With our years of experience on thousands of washers, you can rest assured we’re familiar with your washing machine and we have the right parts for the job. Whether you’re looking for washing machine maintenance, washer repair, or are interested in a brand new top-of-the-line washing machine, Sears Home Services can help. We’re your best option for quick and easy local repair and maintenance of front loading, top-load and portable washing machines. Whether your washing machine is leaking, your washer won’t start, or your washing machine smells bad, you can count on Sears for the best washer service technicians in the business. Technicians that are local, licensed and vetted, with the skills to get your dryer up and running again. If you’d like to know whether one our washing machine repair techs can address your problem, call or schedule your washer repair appointment online. Very competent and professional technician.